A man suspected of attempting to rob two businesses in Piney Flats last July, then forcing a standoff with police which closed off a section of Interstate 26 when he threatened to jump off a bridge now faces additional charges. Christopher Brown, 33, has been arrested and charged with possession of stolen property and possession of a firearm by a convicted felon. The arrest stems from last year’s attempted robberies of a Dollar Tree and Subway restaurant, to which the man fled the scene, crashed his car, and threatened to jump off a bridge on I-26, causing a three hour standoff. A search into Brown’s vehicle found evidence connecting Brown to the robberies including finding a stolen .22 caliber pistol reported stolen by the Washington County Sheriff’s Office since March of 2015. 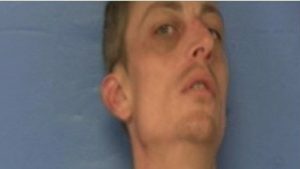 The man is currently held on bond in the Washington County Detention Center.